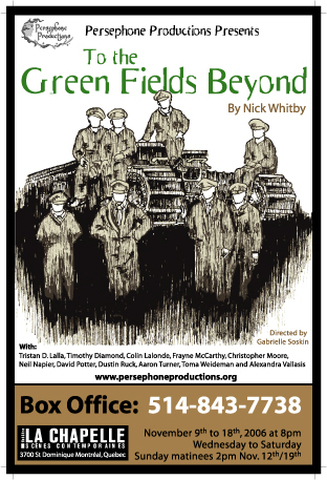 artistic Director of the Donmar Warehouse, London England, was so impressed by this new play To the Green Fields Beyond by Nick Whitby that he altered his 2000/2001 season in order to produce it. Playwright Nick Whitby has written a South American trilogy for the Edinburgh Fringe Festival and is well known for a series of comedy sketches that he wrote for various alternative comedians including Eddie Izzard and Sean Hughes. He has also written for Central Television. His play To the Green Fields Beyond was part of a new writing initiative promoted by the Donmar. The Play "Through the red Through the colours living dead Keep our bond From the mud Through blood to the Green fields beyond"
Set in a forest at night in France towards the end of WWI, 1918, an eight-man tank crew awaits to go into battle. The play is a powerful, debate about the nature of war and human sacrifice with arguments that have been explored since Shakespeare's Henry V walked among his soldiers and tried to justify war, right up to our own war torn world. The play raises many questions. Why fight? What is achieved through death on the battlefield? Who decides that one life should be sacrificed for another? "What are we, a tank crew, but eight pieces of a knight." The Tank Corps crew members were originally exclusively British but as the Corps expanded, men were recruited from all over the British Empire including the West Indies and some half a million men from the Indian subcontinent.